A trio of Austin-area wide receivers headline the first Fabulous 55 of the 2019 cycle. Lake Travis’ Garrett Wilson, Cedar Ridge’s Jaylen Ellis and Bowie’s Elijah Higgins are racking up college offers and shooting up rankings lists across the recruiting services. Their goal is simple: Put the city of Austin on the map as a recruiting hotbed. And to open the eyes of college scouts and hope their talents provide opportunities for overlooked prospects across the city. The highest-rated of the trio is Wilson, a 4-star prospect who helped lead Lake Travis to a state championship. His offer list is 27-teams deep and includes power programs like Ohio State, Michigan, Texas, Alabama and Oklahoma. He ranks at No. 7 on the Fab 55. He caught 98 passes for 1,773 yards and 26 touchdowns in his junior year. Wilson also helped as a rusher, a returner and on defense. Wilson and Higgins are imports to the area. Both moved to Austin around middle school, Wilson from Ohio and Higgins from Florida. Ellis, who has committed to Baylor, is the only home-grown player among them. He recorded 56 catches for 1,248 yards and 14 touchdowns as a junior. Ellis is No. 32 on the Fab 55. Cedar Ridge reached the fifth round of the state playoffs for the first time in school history. Life changes for most top prospects during their junior season. Coaches come calling. Expectations grow. Media members call. It all becomes worth it when the first offer is presented. A future home to play football and earn a college degree is the dream for most football players. Wilson and Higgins have received Texas offers. Ellis is on Texas’ radar and is in contact with UT receivers coach Drew Mehringer and defensive backs coach Jason Washington. The Longhorns have offered 10 receivers in the 2019 class. 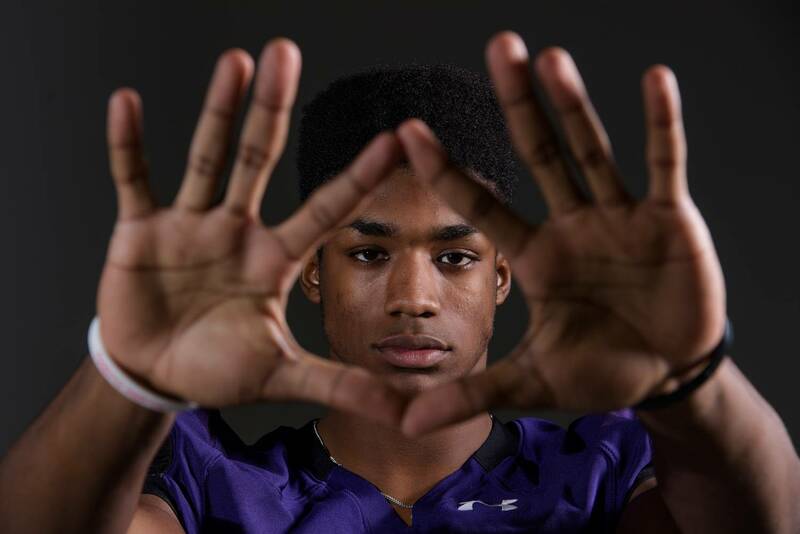 If 2018 was the year of the defensive back in the state — there were 11 cornerbacks or safeties on the Fab 55, including the top five-rated prospects — then 2019 is the year of the receiver; 10 receivers are on the initial 2019 list, including the top two overall (Cuero’s Jordan Whittington and Fort Bend Travis’ Arjei Henderson) and four of the top seven. Wilson isn’t worried about distance, but Texas being his new hometown team will play a factor. He plans on attending Texas’ junior day in mid-February. There is a list of qualities Wilson wants in a school.